1970’s Yé-yé punk pop? An old genre’s new sub-genre? Even in this, the heyday of music categorizing snobbery that seems to delight fans, bloggers, and YouTube commenters round the globe, The Better Letters aren’t that easy to classify. So fall back for five minutes and let’s review. I’ll start with what’s not confusing: the lyrics. 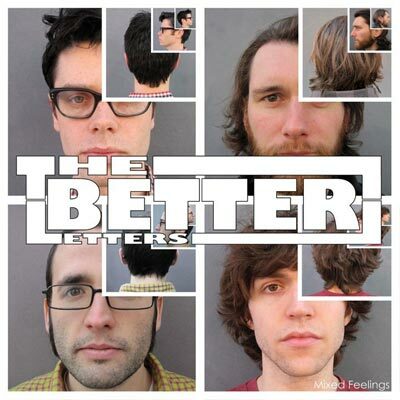 The Better Letters’ first LP, Mixed Feelings, pops with lyrics comparable to that of The Mountain Goats, in a stream-of-consciousness, straight-to-the-oint, conversational kind of way. Some lyricists toy with you, but this band isn’t playing around. This LP harbors no metaphorical mind fucks, though if it does, please let me know because in that case, I’ve completely misread it. I get the feeling The Better Letters’ process involves gathering inspiration from quirky happenstance, jumping into the nearest basement, and just letting everything flow, man. When in “Car Wreck” they shout, “I’m gonna wreck your car!” there’s no need for interpretation; they’re just going to wreck it. Produced with crisp snare drumlines and hyperactive lyrics that take boat complimenting seriously, “You Like Boats” shows what is really good about Mixed Feelings. “I really like what you’ve done with the place/ I must say you have a good eye,” they sing, and it seems the vocalist genuinely likes what she’s done with her place (I’m guessing it’s a girl here — an ex, perhaps?) and maybe is even a little bit jealous? And maybe this girl lives on a boat? Intriguing! When the album misses the mark, it’s mainly because the melody is too whiny or just too unremarkable. We can only take so much repetitive guitarwork and “fun in an ironic way” lyrics. Bred of the ’80s, we are so bored at all times our minds need twist endings; we require reading spoiler alert blogs the day before an album drops just to cushion the blow. I like this band. Their lyrics remind me of my friends’. The Better Letters just need some time.